With the e-commerce scene booming in India, thanks to startups such as Snapdeal, Flipkart and Infibeam, Indian handicraft workers have begun to adopt e-commerce in order to boost their sales, moving beyond the existing traditional channels. 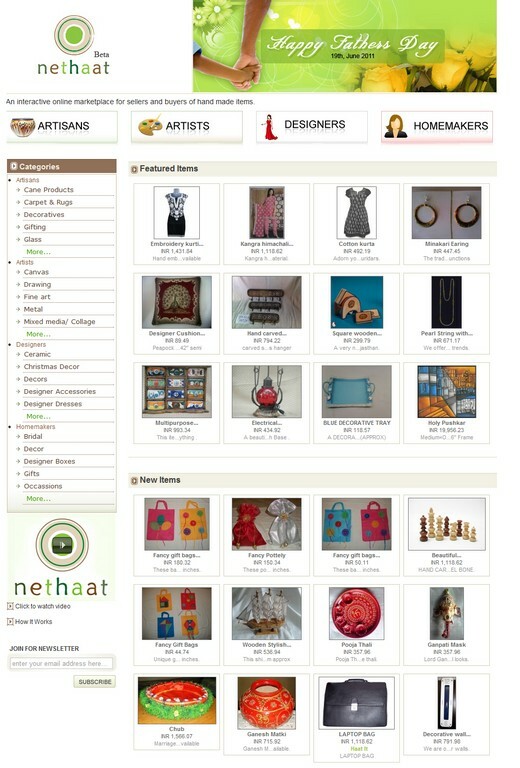 One of such sites is the New Delhi based Nethaat.com which launched earlier this year, to provide handicraft artisans a platform to sell their handicrafts. My uncle used to go from place to place selling hand-printed cushion covers and bed linen. He could sell what he carried with him but nothing more. I wanted to set up a permanent platform for people like him to sell his goods. Launched in January, Nethaat offers a wide range of handicraft products such as carpets, necklaces, earrings, decorative items, gift bags, paintings and marble sculptures with prices ranging from Rs 50 ($1) to Rs 40,000 ($895). It also offers a place called “Haating” where buyers can negotiate the price of an item with its seller, much like bargaining which is prevalent in Indian markets. And if you feel the need to protect your design, it has a locker feature which will safely keep your designs and handmade creations and you can create passwords to show the items to the people of your choice. Also, Nethaat helps artists in creating and managing their own stores and offers help in packaging and customer service, through a network of representatives across the country. As far as its business model is concerned, Nethaat gets 3.5% of the product revenues from every artist who sets up a shop on its platform. Further, it charges artists who require a larger inventory space ( >25 products) with a monthly rental of Rs 400 ($8.95). Artists seem quite happy with this new platform, which cuts out the need to have a middle-man. We are good at what we do. But without a platform like this to sell our products directly to consumers, we wind up ceding all profits to middlemen. This way, we can at least hope to get a fair price and get some credit for our skill.